Last Friday I attended my dad’s 60th birthday party. It was a lot of fun and was nice to catch up with two of my cousins that I haven’t spoken to for some time. One may think that a 60th birthday party would be a staid affair, but not this one. I was amused as the night went on, how my dad and his best buddies broke into loud beer drinking songs—much like you would expect to hear at a fraternity party—several times that evening. It’s interesting when you turn that corner in your relationship with your parents and you become more like a friend. Sometimes it’s still a little shocking to see the adult side that was hidden from me as a child—like my dad’s secret passion for karaoke—which I think is hilarious. Let’s see, what else can I report about the weekend? I had planned on going shopping for something new to wear for my trip to Chicago this weekend, but we had a pretty strong storm on Saturday that even knocked out my cell service for awhile, so I stayed home. Then, just when I had the perfect outfit picked out online for the trip, I learned that the weather report predicts cold, rainy weather for the weekend in Chicago. That’s so disappointing. Now I need to regroup and find something relatively warm for a rainy weekend in the upper 50’s. Boo-hoo! I am hopeful that by some miracle, an unexpected warm front moves in instead. The last time I went to see my girlfriend, I was caught in a terrible rainstorm after leaving the El train station. Picture me with my hair all ready for a big night out, and the crazy wind is blowing my umbrella inside out—and my freshly salon styled hair with it. This time, I am planning on getting ready when I arrive, rather than the other way around. 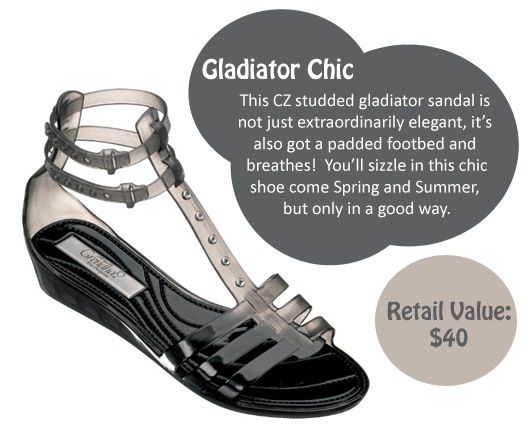 Oh, I also received my new gladiator jelly sandals that I won from Running With Heels on Friday. They are very cute, and best of all—they fit! Just as an FYI, RWH is giving away a Clarisonic Skincare brush today, so you better hurry and leave a comment! Well, that’s about it for now. I’ll talk to you again soon! Hi guys I apologize for my absence. As I write this I am experiencing patterns of chills and extreme warmth. I discovered yesterday that I have strep throat. So to say the least I am not feeling well. I had two days to take care of business at home and then as my present I won strep. Regularly scheduled posts are coming soon. I need at least one more day to recover. On another note, I am thrilled to announce that I was asked to be a guest blogger by the fabulous on-line magazine Running With Heels. My story “Earth Day & Eco Shoes” will be featured on their site today. I hope you have a chance to stop by and leave a comment. Click on the logo below to go right to the post. For those of you new to the site, welcome and be sure to check my sidebar for topics of interest. I also write Fashion Lessons each week. You may type Fashion Lesson in the search box to the right of this post to find a listing. If there is a topic that you are interested in knowing more about, feel free to leave me a comment. Once again, thanks again for visiting Fashion Sensei and I hope to hear from you!